White matter is composed of myelinated axons and glia and connects distinct areas of the cortex. White matter modulates the distribution of action potentials, acting as a relay and coordinating communication between different brain regions. There are three main kinds of white matter tracts: projection, commissural, and association. The largest white matter structure of the brain is the corpus collosum, a form of commissural tract that connects the right and left hemispheres. corpus collosum: A wide, flat bundle of neural fibers beneath the cortex that connects the left and right cerebral hemispheres and facilitates interhemispheric communication. grey matter: A major component of the central nervous system, consisting of neuronal cell bodies, neuropil (dendrites and unmyelinated axons), glial cells (astroglia and oligodendrocytes), and capillaries. 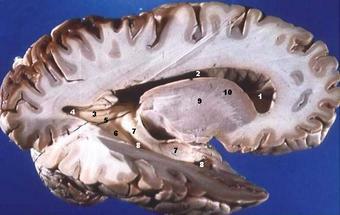 gyri: Ridges on the cerebral cortex, generally surrounded by one or more sulci. A lateral cross-section of the human brain: White matter appears white in this dissected human brain, while gray matter appears darker. White matter is composed largely of myelinated axons. White matter is one of the two components of the central nervous system (CNS). It consists mostly of glial cells and myelinated axons and forms the bulk of the deep parts of the cerebrum and the superficial parts of the spinal cord. In a freshly cut brain, the tissue of white matter appears pinkish white to the naked eye because myelin is composed largely of lipid tissue containing capillaries. The axons of white matter transmit signals from various grey matter areas (the locations of nerve cell bodies) of the cerebrum to each other and carry nerve impulses between neurons. While grey matter is primarily associated with processing and cognition, white matter modulates the distribution of action potentials, acting as a relay and coordinating communication between different brain regions. Projection tracts extend vertically between higher and lower brain areas and spinal cord centers, and carry information between the cerebrum and the rest of the body. Other projection tracts carry signals upward to the cerebral cortex. Superior to the brainstem, such tracts form a broad, dense sheet called the internal capsule between the thalamus and basal nuclei, then radiate in a diverging, fanlike array to specific areas of the cortex. Association tracts connect different regions within the same hemisphere of the brain. Long association fibers connect different lobes of a hemisphere to each other, whereas short association fibers connect different gyri within a single lobe. Among their roles, association tracts link perceptual and memory centers of the brain. The corpus callosum (Latin: “tough body”), also known as the colossal commissure, is a wide, flat bundle of neural fibers beneath the cortex in the eutherian brain at the longitudinal fissure. It connects the left and right cerebral hemispheres and facilitates interhemispheric communication. It is the largest white matter structure in the brain, consisting of 200 to 250 million contralateral axonal projections. Corpus Callosum: Location of the corpus callosum in the cerebrum. The posterior portion of the corpus callosum is called the splenium, the anterior is called the genu (or “knee”), and the area between the two is the truncus or body of the corpus callosum. The part between the body and the splenium is often markedly thin and thus called the isthmus. The rostrum is the part of the corpus callosum that projects posteriorly and inferiorly from the anteriormost genu. The rostrum is so named for its resemblance to a bird’s beak. Agenesis of the corpus callosum (ACC) is a rare congenital disorder in which the corpus callosum is partially or completely absent. It is usually diagnosed within the first two years of life and may manifest as a severe syndrome in infancy or childhood, as a milder condition in young adults, or as an asymptomatic incidental finding. Initial symptoms of ACC usually include seizures that may be followed by feeding problems and delays in holding the head erect, sitting, standing, and walking. Hydrocephaly may also occur. Other possible symptoms include impairments in mental and physical development, hand-eye coordination, and visual and auditory memory. In mild cases, symptoms such as seizures, repetitive speech, or headaches may not appear for years.